It’s the sestiere that Venetians call truly Venetian. 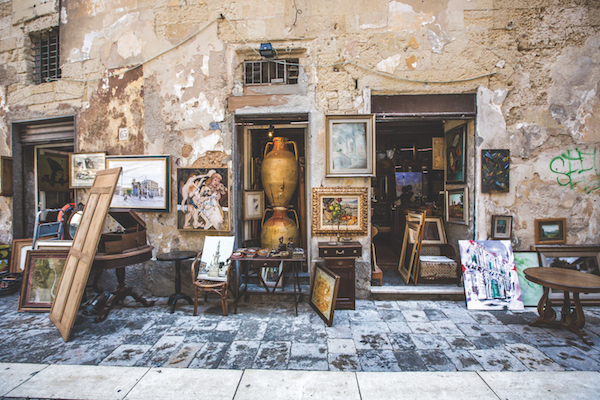 The neighbourhood of Castello consists of the same narrow lanes, broad campi and monumental churches as the other five sestieri, but it lacks the crowds and the tourist-trap trattorias. In Castello it’s rare to find a waiter standing in the street urging you inside. You’re more likely to find that your chosen restaurant – modest, despite its excellent reviews – is located next to the local chemist or a shop selling washing-machine parts. Castello exerts a slow charm but it’s probably the easiest sestiere in which to feel at home. Teenagers come charging out of the Liceo Scientifico on Fondamenta di Santa Giustina, the cloisters of Chiesa San Lorenzo have been turned into the supermarket and the Alta Acqua bookshop has steps made out of old magazines and a seat where you can read as the canal water laps into the shop. But Castello is also full of beautiful churches, palazzi and scuole. Venice’s mighty Arsenale rises like a gigantic Gothic fortress at its eastern end, where it’s guarded by the island of San Pietro di Castello (from which the sestiere takes its name). 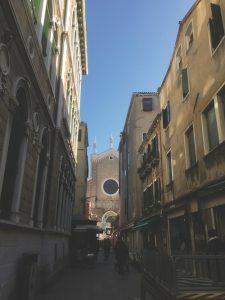 Two of the most imposing churches in the whole of Venice, San Francesco della Vigna and the Basilica dei Santi Giovanni e Paolo, are just half a kilometre apart in the northern corner of the sestiere. I have a favourite walk every time I visit. It’s good to check that not too much has changed in this, the largest of Venice’s sestieri. I start on Riva degli Schiavoni, outside Santa Maria della Pietà. This tall, mid-18th-century church was built on the site of the Santa Maria della Pietà for which Vivaldi composed so much music. Not surprisingly, daily performances of his Four Seasons are advertised in the portico. Next door is the Metropole Hotel, whose bar contains columns from the original orphanage where Vivaldi once taught violin. Unwanted girl babies were abandoned in a niche cut into the side wall of what is now the hotel. Turning left towards the Arsenale, the broad Schiavoni quayside stretches into the distance, broken up only by marble bridges over small canals and the tables and chairs of cafés that exploit the wonderful view across to the island of San Giorgio Maggiore. 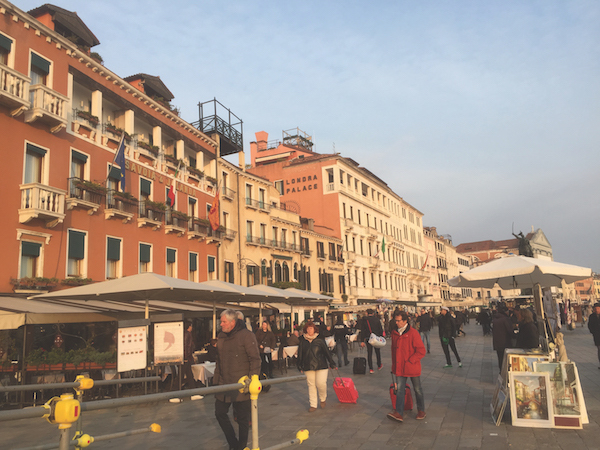 In Vivaldi’s time this quayside was full of traders from all over the Venetian empire. Now it is full of vaporetto stops and stalls selling carnival masks, but plaques on the wall of old warehouses and hostels record where the poet Dante, the scientist Christian Doppler, and the Cabots, father and son explorers, lodged. Turning into Via Garibaldi (one of the canals that Napoleon filled in to create a street) I usually nip down the sotoportego (an alleyway under a building) that leads to Calle del Forno, weaving round some blind corners to reach the Arsenale. This back route has the advantage of bringing you to the very spot on which Canaletto painted his serene View of the Entrance to the Arsenal in 1732. It looks remarkably unchanged. There’s a small maritime museum here with boats, including a ducal transport, and across the wooden bridge that Canaletto depicted so clearly, a number of carved lions that were seized by Venice’s fearsome trading fleet on its travels and left here. The tallest, called the Piraeus lion has some Viking runes carved on its flank. Walking along the canal that encircles the Arsenale brings me to Chiesa di San Martino, which has the Arsenale’s military chaplain as its minister. It also contains the funeral monument of a 17th-century doge, Francesco Erizzo, and a portrait of the Madonna in Sorrow by Palma il Giovane. 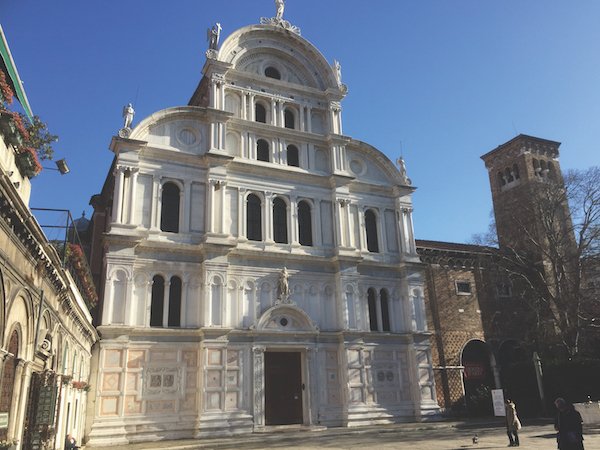 The prolific Sansovino designed the current structure and yet it’s rarely visited by tourists. It’s always just me and a few old ladies. More weaving through narrow lanes and under sotoportegi brings me to Campo Bandiera e Moro. Its name commemorates the Bandiera brothers and their companion Domenico Moro, who were executed by an Austrian firing squad in 1844 during the Risorgimento. The brothers were sons of Baron Francesco Bandiera, whose home, Palazzo Soderini stands in this campo. Also on this square is the church of San Giovanni in Bragora, where Vivaldi was baptised in 1678. A copy of his birth certificate is on display inside. From here I head west through an area of Castello where many Greek traders used to live, as indicated by names like Salizada dei Greci, Calle dei Greci and Corte dei Greci. 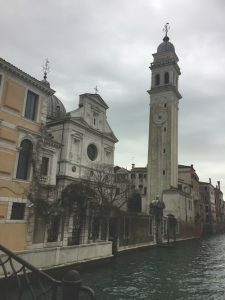 The Church of San Giorgio dei Greci has a wonky, leaning campanile to rival Pisa’s, seemingly lurching into the canal below. On the bridge opposite, close to Crazy Bar Venezia, gondoliers congregate, hoping for trade. I’ve said hello in the past but have always been put off by the board that explains how much they charge. In any case I’m walking today all the way along Fondamenta di San Lorenzo to the huge brick Chiesa di San Lorenzo itself. This 16th-century church never received its marble façade and has been under restoration – still incomplete – for decades. There is a rumour that Marco Polo was buried inside, but actually it’s more likely he was buried at the no longer extant Church of San Sebastiano. Skirting the church and crossing another canal I come to the Corte Nova Shrine, which is located under a sotoportego that leads to this courtyard of apartments. Set into the pavement there is a pink marble flagstone which locals touch for good luck. An inscription tells that an image of the Virgin and St Jerome in this very passageway saved the neighbourhood from a devastating plague of 1630. It has allegedly continued to save lives ever since, including during the Austrian aerial bombing of 1917 and 1918. From here I pass a row of shops selling fruit and vegetables and wine from casks – just bring your own plastic bottle for €4 worth of prosecco. Now I turn right, passing Palazzo Contarini della Porta di Ferro. This is one of many palaces built for the Contarini family, who also financed Ca’Doro on the Grand Canal. This palazzo is 14th-century and looks semi-derelict from the streets. Deceptively, behind its iron gate it’s clear it has been turned into luxury apartments. 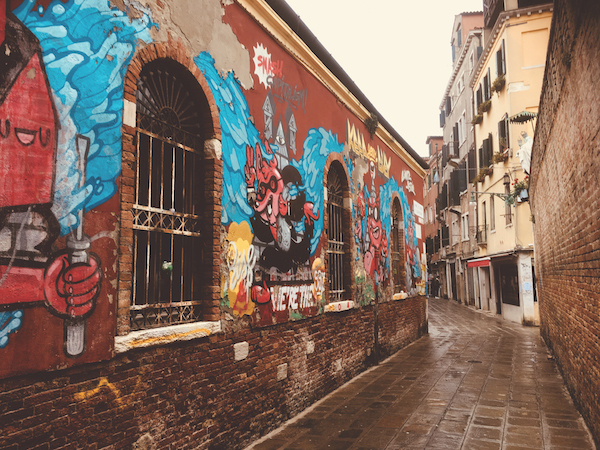 Now I turn left, heading north past a wall that is – surprisingly – a riot of colourful graffiti, to cross over to the massive San Francesco della Vigna. 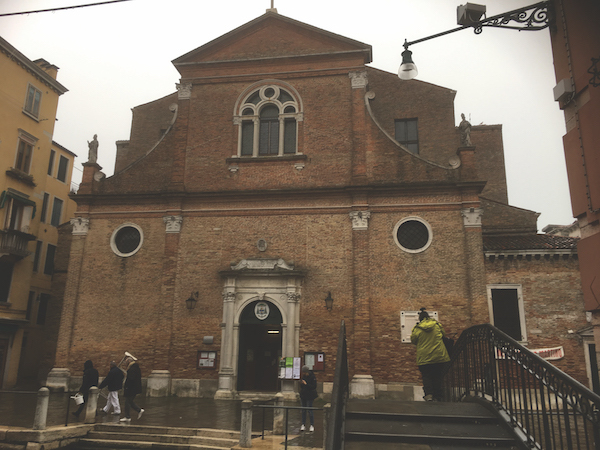 This, along with Santa Maria Gloriosa dei Frari, is one of two Franciscan churches in Venice. It was designed in sober Renaissance style by Jacopo Sansovino in 1554 but given a splendid façade by Palladio, who was brought in to bestow some of his customary panache in 1562. Sadly you can never get far enough away from the façade to see it properly. An old gasometer intrudes on one side onto the campo on which the church stands. This is Castello after all, where every day the sublime rubs shoulders with the grimy. Inside, the church has a severity befitting the Franciscans but its chapels, pre-sold in the 16th century to aristocratic families in order to fund the building project – are full of votive art. Works by Palma il Giovane, Veronese, Negroponte, Tiepolo, Pellegrino and Paolo Veronese are crammed into these recesses. An hour in this church is not wasted, but if you only have a short time, look for the Bellini in the Cappella Santa which Ruskin grumpily claimed was the only reason to visit San Francesco. Nearing the end of my morning walk, I pass the Church of Santa Maria dei Derelitti which has been deconsecrated and is now used for concerts. Its façade was decorated by Baldassarre Longhena and contains extraordinary sculptures of giants by Giusto Le Court. Once again I find myself wishing I could get further back to appreciate their monumental muscularity. I end up at Venice’s most beautiful church (forget San Marco). Known locally as Zanipolo but officially as Chiesa di SS Giovanni e Paolo, this is a lofty Gothic masterpiece and contains funerary monuments to 25 doges, each more spectacular than the previous. The Chapel of the Rosary contains a dramatically carved ceiling featuring three paintings by Veronese. Another hour can be happily expended here and nearby there are coffee shops next to the statue of Bartolomeo Colleoni, Captain-general of the Republic of Venice, when you need a break. Finally I’ll walk into the hospital – yes, Venice’s modern hospital is entered through the beautiful Scuola Grande di San Marco. No hospital reception in the world can compare. Once inside, signs to Oncologia and Radiografia rub shoulders with ancient cloisters and the most wonderful chapel, which was part of an old leper hospital that once stood on this spot. How many hospitals can boast Tintoretto’s Saint Ursula and the Eleven Thousand Virgins on its wall? We are now at the northern border of Castello. Across the next bridge I’ll be into bustling Cannaregio. But what an extraordinary neighbourhood Castello is. Nowhere else does Venice so effortlessly combine the mundane and sublime. Find out where to stay and the best places to eat in Castello in our travel guide.